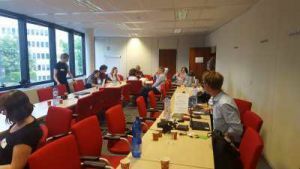 An EU NGO Network on Green Public Procurement training session took place in Brussels, Belgium on 20 June 2017. The network is coordinated by ICLEI Europe and aims to support NGOs in encouraging public procurers in their regions of operations to embrace GPP. The training included several activities to further strengthen the knowledge of green public procurement through discussion and working groups on several GPP related topics including ecolabels, green energy, food and catering and forest products. Discussion groups focused on topics such as the steps in a procurement process, on how to organise a GPP awareness raising workshop and more generally on how to identify opportunities for public authorities to work on GPP. The event gathered more than 20 participants from various NGOs around Europe who shared their own experiences and knowledge on the topics addressed. For more information on the EU NGO Network on GPP, including a summary of the training and downloadable presentations, on the SP Platform.